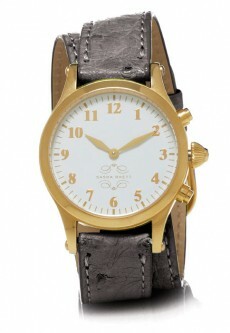 Click the button below to add the Gold Round Watch with Double Wrap Strap - Grey Ostrich to your wish list. Introducing the brand new Sasha Rhett round watch face. With a 32mm diameter and masculine-inspired dial, the new round collection is an incredible addition to the line. Remember that new round faces fit on all existing Sasha Rhett straps so you can use this new face with the straps you already have at home. Double strap wraps twice for maximum strap exposure, available in Genuine Ostrich, Snake Skin, Leather and Patent Leather. Strap is easily interchangeable with all other Sasha Rhett watches.Click here for strap switching instructions. All straps available with a gold-colored buckle and a silver-colored buckle to coordinate with 18k gold plated watches and stainless steel watches respectively.